The Universal III is member of the Universal series, which introduced the “quick change” form roller assembly where each one is independently set into brackets inside the carriage with height adjustment knobs on the ends of the core. This frameless design eliminated the need to adjust the front and back roller on each side in tandem as on earlier models, such as the No. 3, No. 4 and 219. Only the rear form roller contacting the ink drum has a gear. The oscillator and a single rider are mounted on the carriage on arms that swing up and away from the form rollers for cleaning. Power ink distribution and an automatic wash up unit was standard. 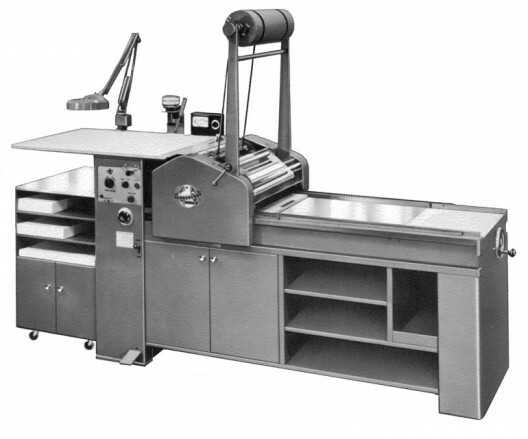 Optional features included an adjustable bed, variable-speed power carriage and a tower for registration tapes or an automatic frisket roll, ink fountain and ink monitor. Maximum form: 18 × 24″; maximum sheet: 18¾ × 28″. More than one hundred Universal III presses are listed in the Vandercook census. Two larger models the Universal VI and V were also made, but are exceedingly rare. See Universal I.